The Newark Housing Authority builds and maintains affordable housing to encourage economic independence and healthy communities. The organization administers the Housing Choice Voucher Program, which is a national rental assistance program funded by the U.S. Department of Housing and Urban Development. The program assists low- and moderate-income families by paying a portion of the family’s rent each month. The New Jersey-based organization serves about 5,000 families. Newark Housing Authority maintained numerous print and electronic documents of different types, which ranged from inspection reports, recertification packages, tenant, and owner identification documents, correspondence, and hearing results. 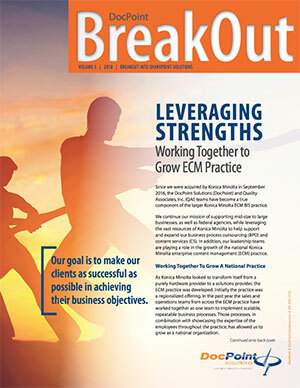 The nonprofit’s backlog of print files amounted to approximately 850,000 printed pages. 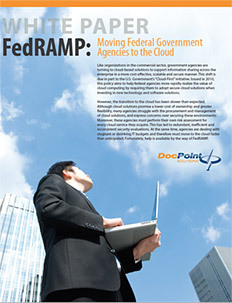 Heavy reliance on this paper-based system made it difficult, if not impossible, for employees to collaborate on a single tenant file or access information simultaneously. Overall, too much time was required to process new applications for the program. The paper-based system also made it difficult to spot possible cases of fraud. Often, employees spent extra time locating and accessing critical pieces of information contained within large paper files. The solution consists of a fully integrated system on that supports document creation, storage, retrieval, routing, and workflow. The Document Management solution adds functionality to the “partially manual and partially electronic” archival and processing system that was in place. 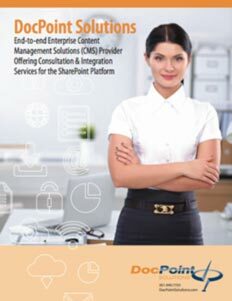 DocPoint provided a securely Hosted SharePoint MOSS Document Management Solution that includes all specifications for computer and scanning hardware, document capture, and management software, and labor services necessary to meet customer’s requirements. The resultant system provides an automated means to digitally capture, route, and manage documents in a way that provides a quick, efficient search, and retrieval functionality. DocPoint was brought in under an existing contract the nonprofit had with Quadel Consulting Corporation, which is a national provider of outsourced management, consulting, and training solutions to the affordable housing industry. Microsoft Office SharePoint Server (MOSS)® - Contains a whole host of tools out-of-the-box that makes it such an effectual Electronic Document Management System. These include built-in collaboration areas, document filtering at the touch of a button, powerful metadata, and word searches, etc. SharePoint® also allows for the integration of innumerable third party tools and applications, such as Quadel’s own quEST® software - their program for handling the processing of the submitted applications. • High-volume, professional-quality scanners from Fujitsu utilizing the Virtual ReScan® plugin - contributing dynamic, automated image cleanup for a range of paper qualities (whether onionskin, carboned or carbonless copies, etc.) and print qualities (un-shading areas, despeckling, line removal, hole-punch removal, etc.). KnowledgeLake® Capture® - Providing a scanning interface that’s directly integrated to SharePoint®, as well as enabling automated indexing by leveraging Optical Character Recognition (OCR) and bar-coding technologies. KnowledgeLake® Branch Capture Server® - Allowing for throttling of network bandwidth usage for the documents as they are passed from the scanning station to the processing server and ultimately to SharePoint®. KnowledgeLake® Capture Server® - Providing customized document processing, routing, and formatting. After the scanning occurs, the rest of the pre-configured process is automated. This is possible as KnowledgeLake’s software is so tightly connected with SharePoint® that releasing the documents into a pre-configured document library is virtually invisible and seamless. All of these tools, along with DocPoint Solutions’ expertise in technical configuration, implementation and training, as well as maintenance and support for all installed software ensure Quadel and the Newark Housing Authority a successful technology rollout. 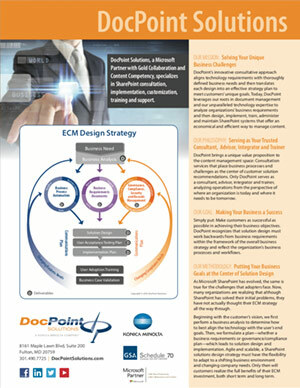 They also have peace of mind, knowing that DocPoint Solutions remains available to resolve technical issues. The MOSS system makes it possible for the 25 employees of Newark’s Housing Choice Voucher program to share documents and files stored in a central document repository using a secure internet connection. They can also scan hard-copy documents and add them into the repository from their desktops easily and with consistent parameters. The EDMS system put in place enables staff to search for, retrieve, and access needed documents for program participants from any internet-connected computer. Furthermore, the system enables staff to easily create and store electronic documents, as well as to include the application documents that were downloaded by the constituent and submitted online. The staff at the Newark Housing Authority now has the ability to readily convert pages of existing hardcopy documents into tiff images, while the electronic management system makes it possible to filter or search for information, then retrieve the appropriate images within seconds. The staff’s time is now used more efficiently, allowing them to provide better service to constituents. The chance of misplacing needed files is eliminated. Furthermore, the possibility of fraud is reduced because staff has improved access to records and cross-referencing by any metadata is as easy as selecting filtering criteria.